Note: I wrote this in 2010 after finishing the LBL Challenge 24hr adventure race, my first ever 24hr race of any type. 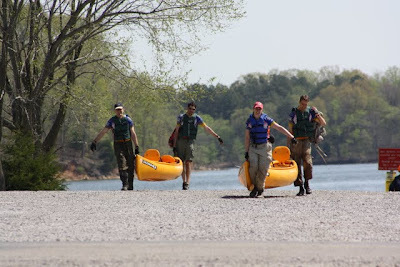 For awhile it was posted on the Mid-Rivers Adventure team website but now that has gone away so I'm posting it here. We took two vehicles down to Paducah, Kentucky for a quick dinner and then zipped over to LBL. We arrived at the HQ, checked into the hotel room, and went up to the race check-in for get our numbers and attend the meeting. Bonk Hard's owner and race director, Jason, revealed a start time of 7am for both courses (12hr and 24hr races would happen concurrently). We received 2 1:24k USGS maps and a clue sheet with 44 checkpoints. We headed back to the room for plotting, route selection, food organizing, gear packing, and eventually some sleep around 12.30am. Race morning we were up a little after 5am, out the door by 6a driving first to Star Camp for a bike drop, then to Birmingham Ferry campground for the start. Our plan for the daylight hours was to push as hard as possible so we would minimize trekking at night. In this first leg, we did just that, punching all nine checkpoints, ROGAINE-style (in any order), within 10 minutes of the leading teams. The woods were in good shape with most of the area runnable. The pace was high but sustainable, the sun was out, and it was going to be a great race. Quick stop at Star Camp to grab the pre-dropped bikes. One of our goals for this race was to minimize transition time so we hustled through and hit the road. 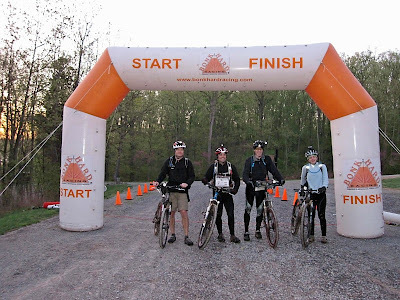 The first biking leg starts with a brief road ride, then a steeply down-hill bikewhack to access the North-South trail. We head northwards for a few controls located on singletrack. Most of the biking controls on this leg are a punch with a cable - no flag. We ride right past the first two controls because we are looking for the flag. Thankfully Bill notices our mistake right away and only have to backtrack for about 50m each time. Soon enough we are onto the paved Hike/Bike trail where we break out the tows. Geiger leads out the train, which works great for a few kilometers before the twisty trail freaks me out and I let go of the tow at a sharp downhill. The loop slingshots out of my hand and right into Mike's calf...sorry!!! I also run out of water early on this leg because I didn't fill my bottles before the bike drop - rookie mistake, but the guys cover for me until we reach the North Welcome Station which has a spigot. A quick refueling and we roll back onto the Hike/Bike trail (this time WITHOUT tows) to continue northward along the Canal Loop and Nickell Branch campground. Later in the singletrack we descend a great hill, all of us catch some sweet sweet air, and shouts of excitement ring out. Check onto the Hike/Bike trail for the second time back south. At this point we transition onto the jeep roads to cut across LBL headed towards Taylor Bay. Bill starts having leg cramp issues on the rolling hills that take him off the bike for a spell here - we do our best to tow him but the unpredictable road conditions make it difficult to keep a good pace. We continue to make progress as best we can and even though we are slow, Bill's nav is clean and we are still keeping up with our plan. We pull a clever trick by stopping at the Furnace where Bill remembers a water spigot from the 2009 race. Everyone is in serious need of hydration and we don't think there will be water at the Taylor Bay transition. We spend a few minutes refilling bladders and a team-mandated 1-bottle chug before hitting the paved road for a short few climbs into transition. We are right - no water available at Taylor Bay so the previous stop saved us some pumping time. We drop the bikes and have access to our pre-loaded gear bags for the first time. Everyone restocks their packs with calories and adds a trekking layer to protect from the undergrowth. Not our team, but we headed into these same woods, except with pants on. We know this is going to be the longest trek and, although it was advertised as ROGAINE-style, only the first half of the checkpoints offer route choice, with the second half requiring a fairly predictable route around Energy Lake. We start out walking to ease Bill's legs into the trek and chose very direct routes to compensate for our pace. This leg covers a great variety of terrain for LBL. We have a chance to refill bladders and rest at a creek, cross a swamp, and even get some nice little climbs. Our pace still isn't great but again the nav is clean and we continue to race the sun to the paddle. Once we have the canoe put-in in sight we stop at a campground to again refill bladders. Cooper has a few stomach issues near the end of the leg but we all make it to the canoes together. One of the highlights of the day comes to us at the Energy Lake transition. The canoe provider brought kayak paddles and there are still some left! As the sun sets we select paddles, boats, and PFDs and get set for a night paddle with no wind and clear skies. The Mikes (Cooper and Geiger) take the first boat with Bill and I following. We immediately hook up the tow so Bill can nav without our boat losing too much ground..er...water. The first three checkpoints are located in Energy Lake. Our strategy, similar to many teams on the night paddle, is to enter the correct inlet and then use Geiger's bike headlamp to scan the shore and hopefully light up the checkpoint. This works flawlessly and very soon we find ourselves finishing up the lake loop. Again, not our team, but shows what pigs these boats are. Also, we did this portage in the dark. Even though the boats are fairly comfortable to sit in, they are heavy and it takes a good effort to haul them across Energy Dam to the riverside. At this point we receive word that the top teams have absolutely smoked the course and are finished. We have nothing but admiration for these speed demons, but at the same time are a little frustrated we are still paddling, and will be for a while. Nevertheless, we continue to beat our estimated schedule so there's no panic among the team. This paddle is quiet and uneventful, just the way my grandma likes her airplane rides. We hit the checkpoints in style and arrive back at Taylor Bay for a gear bag stop. Food re-supply, bathroom stop, and we are back on the water. This leg is a long out-and-back, and was considered this our bail option if things were going badly. But we're still going well so decide to clear the course. Bill helps me with my kayak paddle technique and I see improvement immediately. Now I can definitely see how carrying kayak paddles are an advantage. We have to creatively navigate over a few sand bars but everyone stays upright and mostly dry, even Cooper with his avant-garde rain gear (really wish I had a pic of that). At long last, the canoe take-out arrives and there was much rejoicing. Here we are, almost 2 in the morning in the middle of the woods and the volunteers are still rocking the fire and gear check. Where Bonk Hard finds these brave souls I do not know, but I'm so so thankful for them. Gear check is completed quickly, we stash the canoes (which sadly have not lost any weight) and head out for a short trek. We only have to navigate to one checkpoint, but the middle of the night can make any task challenging. I focus on putting some calories down as Bill takes a clean route to 41. We are able to jog a little on the trails and that puts everyone in a good mood. We are reunited with our bikes and food for the last time on the course. Barring a huge crash or mechanical, we know we will finish the course and that makes us all a bit complacent in transition. Or maybe we are just reluctant to head towards home and end the race. A good combination of roads and singletrack to finish out the course. I unknowingly start to bonk in the first 8k, but thankfully I speak up ("my head feels really weird and dizzy") and the guys instruct me to eat, eat now, and eat a lot. I throw two Ensure's down the hatch and a few km's later I'm back in business. The rest of the roads are a challenge because I am getting sleepy, but once we hit the singletrack it's much easier to stay awake. There are some confusing bits to the trail that do not match the map, but nothing catastrophic and as the sun starts to rise we know we are on the right track for home. Cooper, Geiger, Langton, me! After being out there for 23:15. I love reading your race reports. Good luck this weekend! !